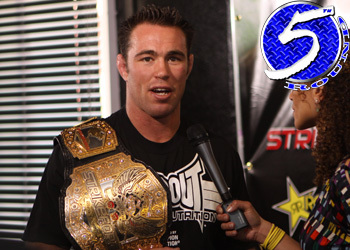 Cesar Gracie Jiu Jitsu houses some of MMA’s most talented fighters, including UFC welterweight top contender Jake Shields. Although their stables are full of thoroughbreds to train with, when you’re entering a fight against champion Georges St-Pierre as a 3-to-1 underdog, it’s understandable why Shields would want to recruit additional help. While he revealed during “UFC Fight Night 24” on Saturday that Chael Sonnen would be coming to town this week to lend a hand, Shields tweeted Sunday night the controversial middleweight didn’t arrive alone. “Picking up [Matt Lindland] and [Chael Sonnen] at the airport, then off to some Sunday sparring,” he posted. Since getting upset by Matt Serra at UFC 69 in April 2007, St-Pierre has masterfully executed the exact same grounded game plan in solidifying his spot atop the 170-pound totem pole. However, in his last outing against Josh Koschek at UFC 124, GSP unleashed a refined standup game and lightning-quick jab which caused Kos’ face to look like THIS. So Jake, was the move to bring in the big bad wrestlers from Team Quest more for offensive or defensive purposes? “I’ve been champ for multiple other shows, but my eye has always been on the UFC and Georges St-Pierre,” Shields stated on Saturday. “I think it’s going to be an all-out fight. It’s probably going to go into the later rounds, but I see myself getting him down and submitting him at some point.